Wed-Sat from 5pm; Sun from 2pm. There's an urgency about a pop-up that gives it an instant sense of adventure. Mind you, it must be easier for a pop-up to come across as braver, fresher and cheekier than one committed to years of rent and rates. So adventurousness is exactly what we should demand of a temporary venue. 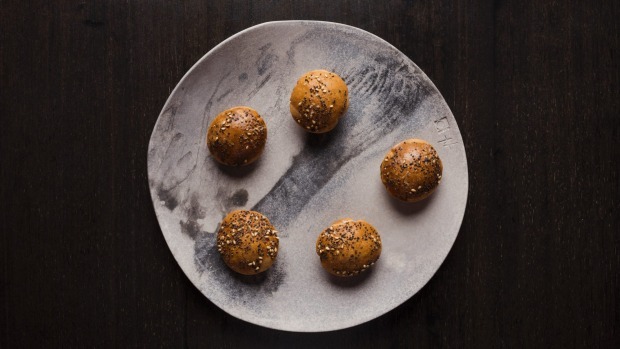 Etelek, which means "food" in Hungarian, first popped up on the old Bar Brose site in Darlinghurst last year, and has since made guest appearances across Melbourne, Sydney and Canberra. 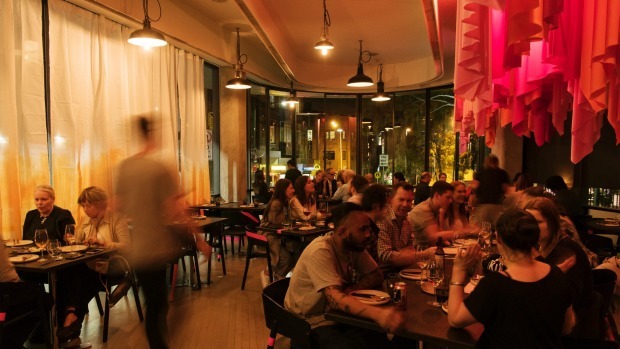 With former Yellow and Monopole chef Adam Wolfers in the kitchen and Cornersmith's Marc Dempsey front of house, it has now slipped quietly into Grant King's old Antipodean/Gastro Park site in Potts Point like a squatter with three months to kill. Having inherited the furniture, there was little left for them to do but punk it up with fluorescent gaffer tape wound randomly over chair backs and legs, and ramp up the personality with a hanging installation of pink textiles. Cheap and effective. 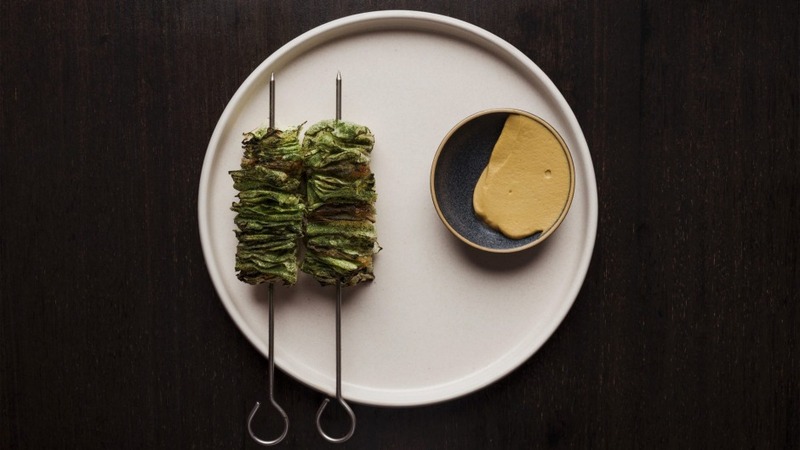 While Wolfers' most successful dishes – twisty plays on Eastern European and Jewish favourites – have been those inspired by his Austrian grandmother, he is now dispensing with labels and broadening the base to include Middle Eastern and North African. The "everything" bagel is genius, a $4 snack that makes you laugh out loud as you bite through bagel dough puff, poppyseed and sesame into a rich squish of buttermilk cream cheese, dill and grated horseradish. Everything you love about bagels in a single bite. There's wit as well as kitchen smarts behind the "parsnip schnitzel" with house-made hot sauce and pickled cucumber ($25), but a few of the more out-there dishes show Wolfers is pushing himself, eager to mine his food memories to break new ground. 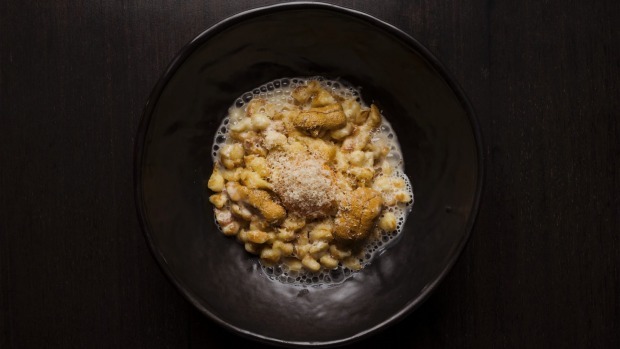 Like the nokedli ($25) of tiny boiled spaetzle (dumpling-like noodles) sitting in a frothy pool of smoked bonito butter, laden with fat, briny sea urchin, confit duck egg yolk and toasty walnuts. The mind might say WTF, but the mouth is incapable of speech, flooded with creamy, eggy brininess. Skewers of sweet, tender sugarloaf cabbage are layered with guanciale and hit with pastrami spices ($9 each) ready to roll in a heavy round of malawach Hungarian flatbread you can smear with mustard. Greek cabbage rolls? Hungarian souvlaki? You tell me. Some ideas feel countryless, like a perfectly fine, whole, crisp-skinned, spice-dusted, roasted flathead ($36) in a herbal green sauce. 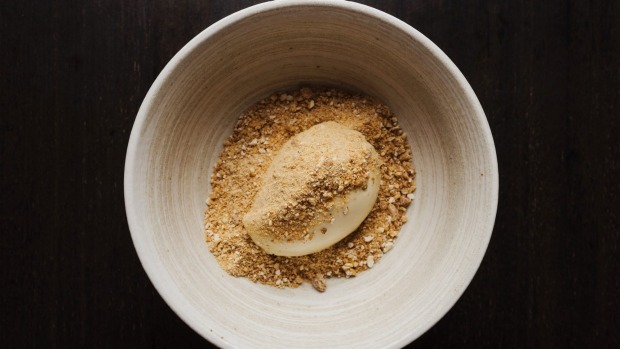 Others just please through the universal passport of deliciousness, like Jerusalem artichoke ice-cream ($15) on a rubble of roasted white chocolate and matzo praline. Its time might be up on October 13, but in many respects, Etelek acts and feels as if it's here to stay. It takes bookings, and offers a la carte and an eight-course tasting menu ($70). Staff know their stuff, and if they don't, they throw to the personable Marc Dempsey, who does. His wine list is both interesting and affordable, offering a 2015 Majnoni Guicciardini sangiovese blend from Tuscany for just $52. The sense of adventure is certainly there, but for me, the most effective dishes are still those with an Eastern European and Jewish foundation. Others feel as if they've crossed too many borders and aren't quite sure where they belong. Perhaps everything needs a place it can call home, after all. Vegetarian Three smaller dishes, two bread dishes, one larger dish, two sides. Drinks Five Etelek'd cocktails, five beers and an affordable, on-trend list of white/golden/orange and pink/burgundy/red wines. Go-to dish Everything bagel, $4. Pro tip Anything with bread – malawach, langos, bagel – is a highlight.